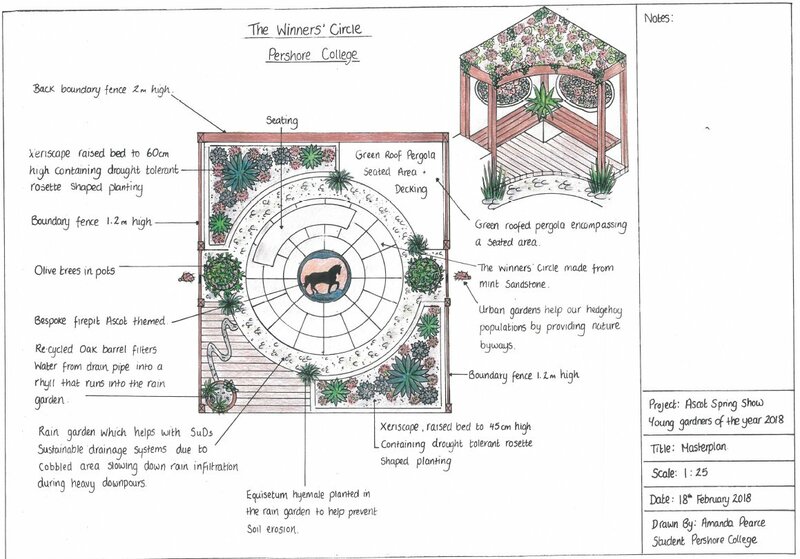 Here is the design that my son Jamie’s team at Pershore College have put forward for The Young Gardeners of the Year competition at the Ascot Spring Show 13-15 April 2018 in Windsor Great Park. Personally I love a circular garden design. My ideal is winding paths, leading off behind shrub and trees so that the eye is led forward and the imagination stirred; what lies round that next bend? Of course we’re all influenced by great gardens that we’ve visited. The genius of the garden designer is to find a pleasing design and planting scheme that will suit the individal size, shape, soil, orientation and circumstances of a particular plot. Perhaps I’ve been influenced by the gardens of great stately homes, tended by teams of highly-trained, devoted and hardworking gardeners. And why not? The ultimate joy of a great garden is, in Paradise and Eden mythology, a place of perfection and supreme reward for those who have the luxury of wandering and resting in it and being nourished by it: and for us, here on earth, a place to dream in. Try this one about lovely gardens in Kenilworth, or this one about Dunham Massey, or perhaps this one about Hidcote Manor Gardens. This weekend I joined a cast in a drama – at St Mark’s Church in Leamington Spa – which I think Shakespeare would have loved. Why? because we were rather like the little band of local workmen in that Athenian wood in A Midsummer Night’s Dream. But we were not playing “Pyramus and Thisbe”. Instead, without rehearsal, and with hastily gathered together props, we were ambitiously – and creatively – portraying the entire story of Joseph, (but not with Lloyd Webber music and lyrics). I must admit I’d been wondering how I’d pan out as the Butler/Servant, with my son Jamie as the older Joseph. I was a little concerned beforehand about the large number of props, and the extent to which I’d need to rely on several other actors simultaneously doing the right thing – not to mention a question about whether there was going to be any kind of stage management i.e. people in charge of making sure microphones and props were in the right hands at the right times. And it was more fun and more memorable than a slick performance by professionals would have been. It occurred to me Shakespeare would have loved it. Even his Rude Mechanicals in A Midsummer Night’s Dream couldn’t have bettered our organised chaos. For anything that could possibly go wrong in such a set-up, did. The two narrators doubled up as stage manager and director. Some of the performers behaved as if they’d only been cast that morning and had never seen the script before. I was convinced others were working to different scripts than the one I had, and I wondered whether it had been revised since I was given my copy. The narrators forgot some of their lines thus depriving actors of cues they’d been relying on. The one hand-held mic was being passed frantically from actor to actor. A prop (whistle) was given to me as the Servant/Butler, which I was to blow every time Joseph gave the instruction for someone to be arrested or released from jail, to alert the jailer. But then the director whipped it away unexpectedly from me and gave it to Potiphar – who didn’t even know he had to use it and spoke his lines without using it. The director intervened and grabbed the whistle and gave it to him. Having used it, Potiphar then put it down somewhere where I, the Servant, couldn’t see it. So in the end I was unable to use it. And since my whistle had disappeared, Joseph’s brother Simeon was never let out of jail. The actor who played the aforesaid jailer wore shorts and a helmet which was too small for him and he looked like an English policeman on holiday in Egypt. The whole drama was like a test case for what happens when a troop of unrehearsed amateur actors get together – exactly as Shakespeare envisaged it with his Rude Mechanicals, with Wall and Moonshine and the chink and Bottom deciding he was going to get up after his character had died and tell the audience it was all right, he was alive really. 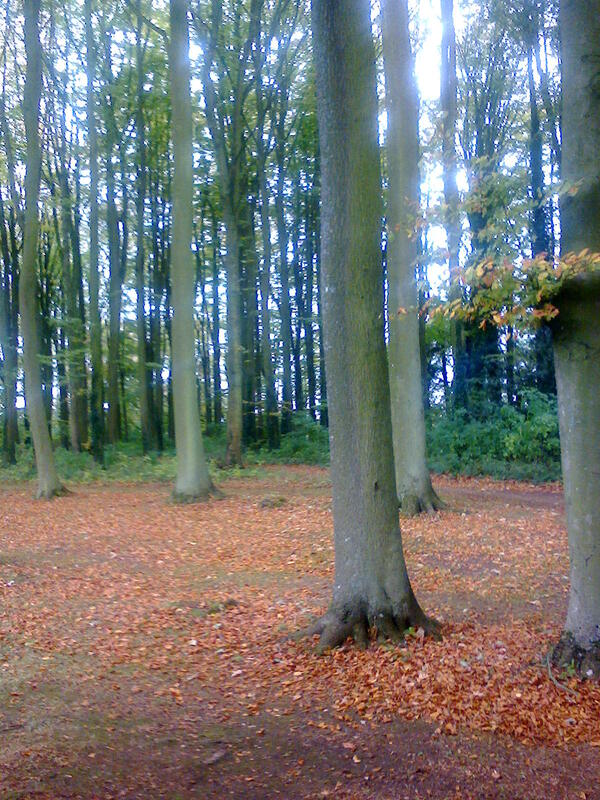 And all this fired up my imagination as I thought how it was going to feed into my new novel – my follow-up to A Passionate Spirit – which features a cast of actors filming A Midsummer Night’s Dream in some south east London woods…. Drenching rains accompanied our tour round HRH the Prince of Wales’ intriguing garden at Highgrove but with so much to wonder at, we all kept going and completed the tour. Highgrove Garden made me think of the plot of a children’s book, quirky, fun, playful. 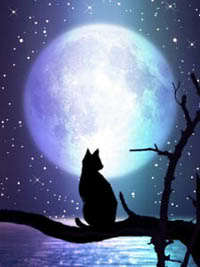 At every turn there is a new surprise, like something dreamed up by Lewis Carroll or Edward Lear. It was an odyssey through a quirky and unpredictable environment. Vistas and views and angles, abundant ferns and eccentric topiary, temples, thatched tree house and giant slate pots abounded. The downpour intensified as we went round, yet everyone was so entranced by the garden, it remained a minor issue – even when we waded through deep puddles on the unmade paths. Moving through the garden is like progressing from one chapter to another in a beguiling story. 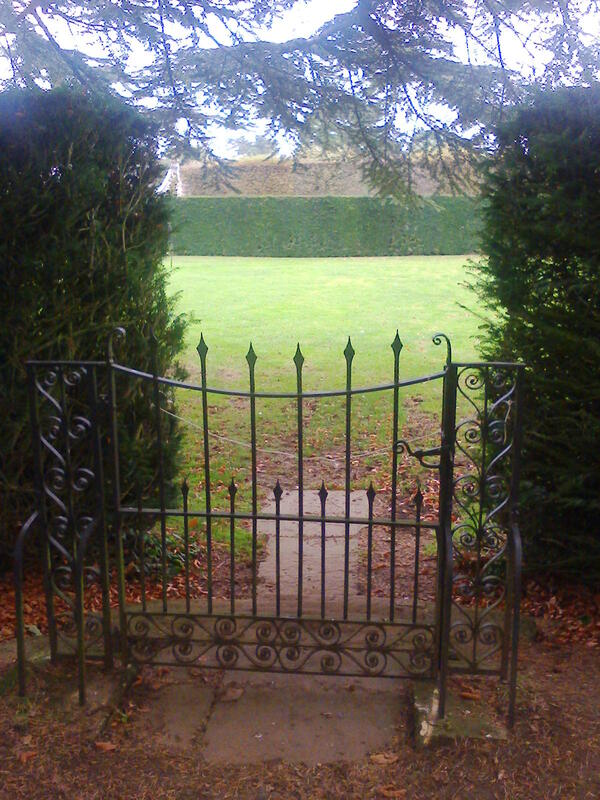 If fairies inhabited this garden they would be the wild, anarchic spirits Shakespeare portrays in A Midsummer Night’s Dream. I particularly loved the juxtaposition of wilderness and artistry. HRH The Prince of Wales has invited artists and sculptors to run wild with their imagination; everywhere you may see the evidence of free expression and creativity. In summary, this is a unique and profoundly inspiring garden. I love Hidcote Manor Garden, near Chipping Campden in Gloucestershire. It’s one of the National Trust’s greatest gardens and was created by an American horticulturalist Lawrence Johnston, between 1907 and 1947. 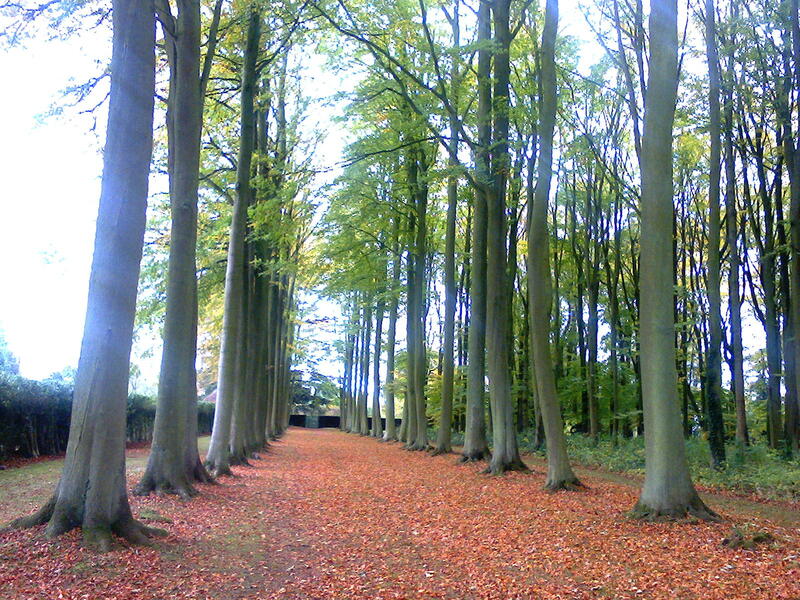 One very special element in the garden is the Beech Allee – an avenue of majestic beeches. Lawrence Johnston planted it knowing he’d never see the mature avenue – it was a gift to the future. For me, it’s very moving to walk along this avenue reflecting upon how much we owe to one man’s vision and imagination. What an encouragement this is to any creative person, who imagines things and works to bring them into reality, perhaps without ever being able to experience the final outcome, or to know how their creation may be received. 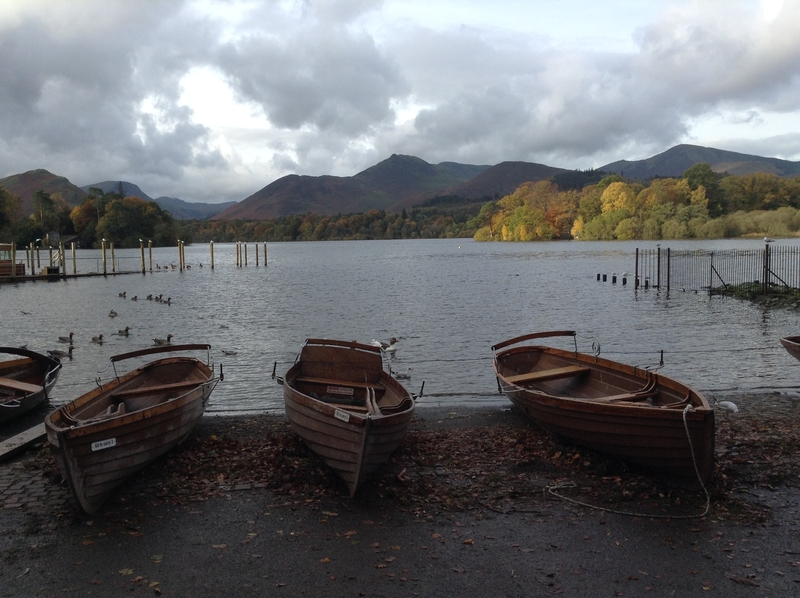 We spent a few days in England’s lovely Lake District during the recent autumn half term. The Lake District is special to me, not only because of its association with numerous famous writers, with Beatrix Potter, John Ruskin, William Wordsworth; but also because of memories from childhood holidays there, and the fact that I regularly visited it during the time I spent as an undergraduate at Lancaster University (approximately 40 minutes drive from Windermere). As a member of the university hiking club, I became familiar with the Old Man of Coniston and Scafell Pike and I soon learned that hiking didn’t mean gentle rambling, it meant something very akin to mountain-climbing except without the ropes and crampons, as we scrambled up and slid down steep slopes of scree! Bowness-on-Windermere is distinctive for me, as I would go there with my parents when they came to visit me for the weekend. For me, it was a translation from the world of student accommodation to the Old England Hotel. 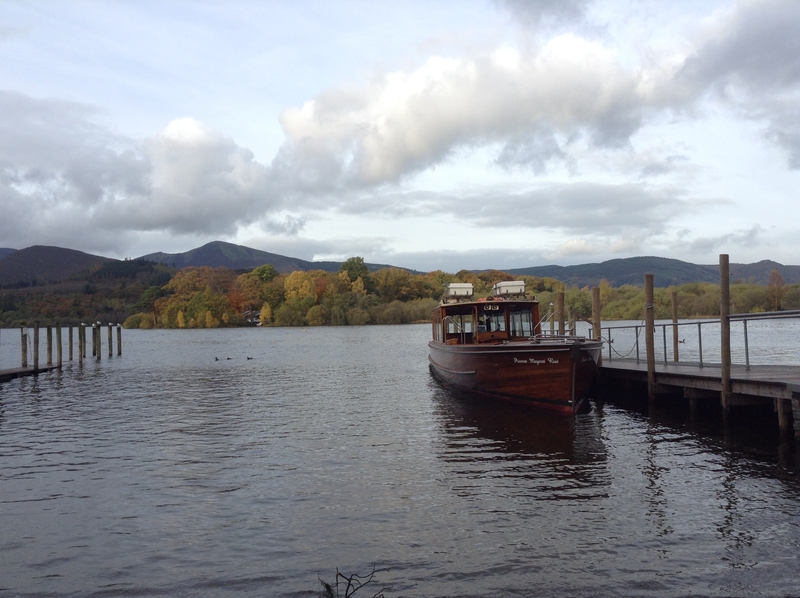 I returned there on later occasions with friends, for afternoon tea on the terrace, overlooking Lake Windermere. The Old England Hotel has held a special place in my memory ever since. 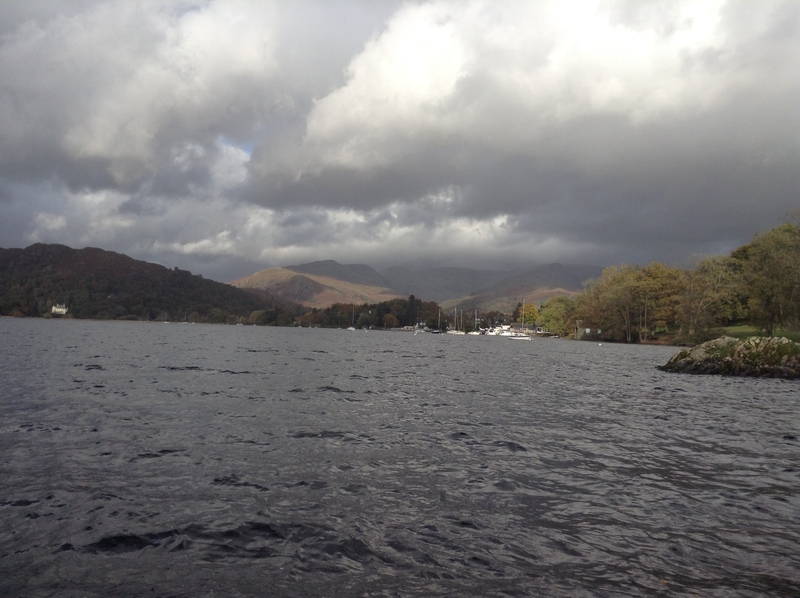 It is said that the Lake District has the highest rainfall in England. 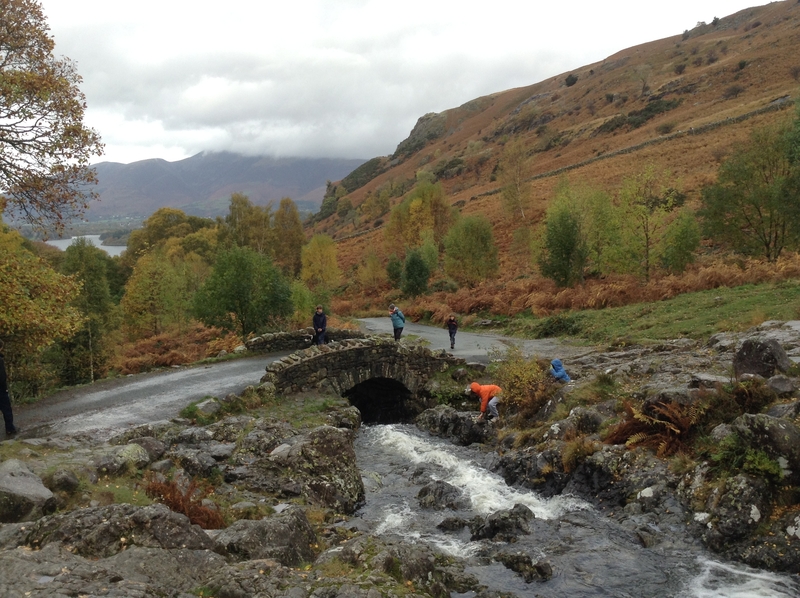 Those who go there must take mist, rain, muted colours, a moist atmosphere, brooding clouds, along with everything else the Lake District has to offer; and be prepared to carry on regardless, wearing waterproofs. If you experience the lakes and mountains in bright sunshine, count yourself blessed! 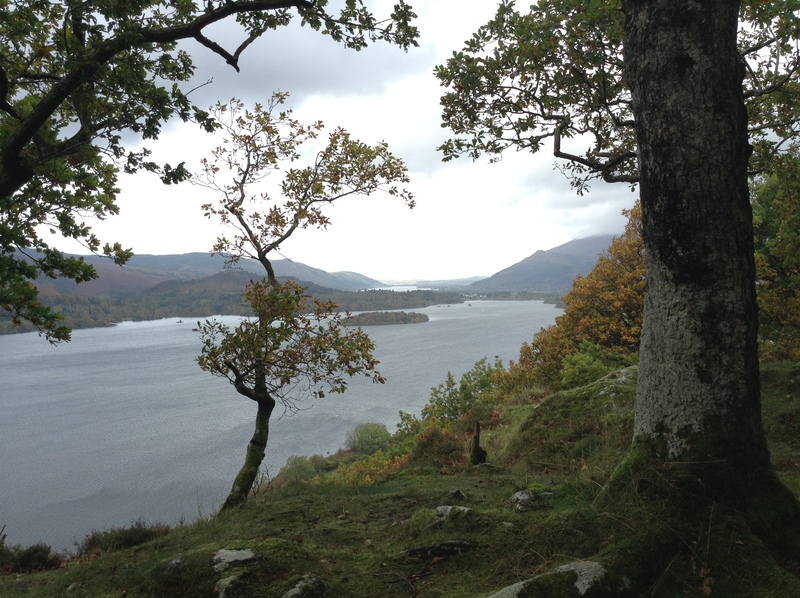 The Lake District is an inspirational place that speaks directly to the spirit. What do we do about art when we wander around great art galleries and museums? We see wonderful things on the walls and maybe we’re overwhelmed. These great art works are distanced from us, somehow, by the awesome spaces and dimensions of the gallery. We could never have these original art works on the walls of our own homes. But they speak to us. There’s something in them we want to take away, something we want to claim for our own lives. Something that tells us about ourselves, our own hearts and souls. Art is not to be confined to museums but is part of something much bigger in life….. we do like to surround ourselves with objects that make our lives less drab. Alain de Botton said what he proposes is that We treat the whole museum much more like the gift shop. I now say that to my teenage son and daughter whenever we’re in an attraction. Ah-ha. The shop. There’s always a little shop at the end. Why did I find this striking? Because of what I do, at home, in my space where I write. 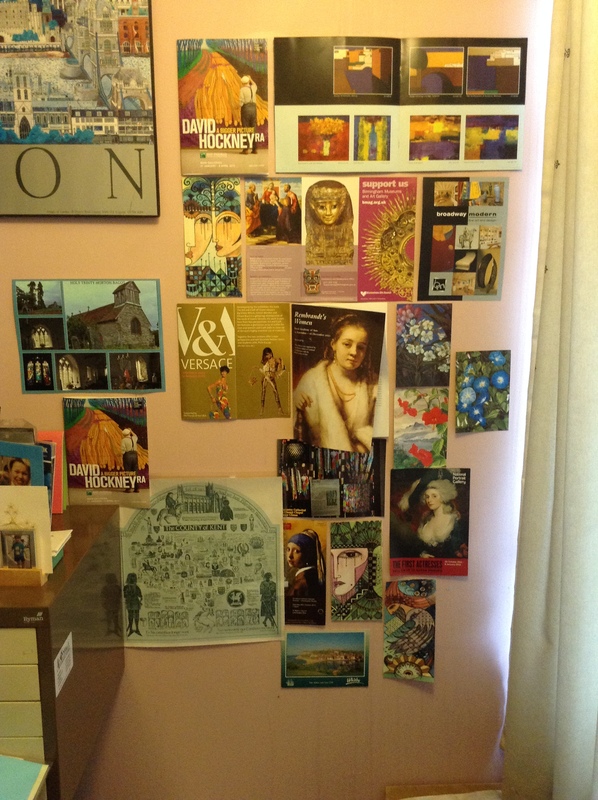 I cover the wall with brochures, leaflets, postcards from art exhibitions. Bear in mind that the room needs redecorating, which is why I’ve stuck those images directly onto the wall! No way can I afford to display original Rembrandt, David Hockney, Verneer on the walls of my home. But I still integrate art into my life. I have invited art into my writing space. Each of the images I’ve stuck onto the wall, is a window. A window into another world, another artist’s imagination, another dimension. In this way, no matter how humble, I integrate something of the artist’s spirit into my own working space. Without art life would be very drab indeed.